fischertechnik Cars and Drives provides a glimpse into how different types of drive systems work. With this set, future engineers can build up to 8 different models. Learn the difference between a friction drive and a rubber-band drive. Discover how a balloon drive and a bending rod drive help propel your model. Or, explore the complexities of wind as it is harnessed to drive models forward. It's all in the Cars and Drives set! 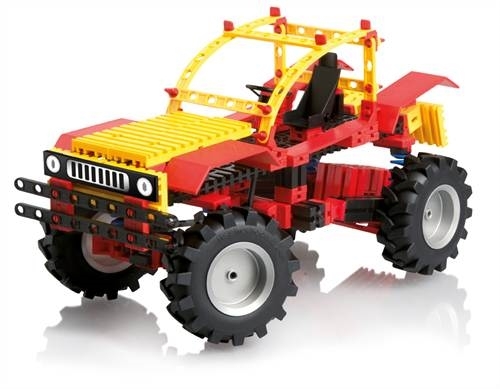 For additional remote control functionality, combine the included off-road vehicle equipped with functioning steering and suspension with the Motor Set XM and Control Set. 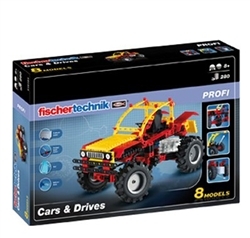 The fischertechnik Cars and Drives set includes a instructional activity and a friction motor to help you build up to 8 different drive models. It is ideally combined with the Motor Set XM, Control Set, Sound + Lights and Accu Set for added capabilities. This set helps user understand how different drive systems work with hands-on models. What better way to combine fun and learning than building your own buggy? Check out which drive systems you can assemble! This model demonstrates how wind can be used for propulsion. Build this sail buggy as described in your assembly instructions. Watch as the wind hits the surface of the sail and propels the sail buggy forward. Experiment with moving the position of the sail and see how your model reacts! Discover how you can drive this model using air molecules. Using a balloon, you can watch as air is released and pushes the model forward - producing the same reactive force that launches rockets into outer space. This model uses the same drive motion uses in ancient times with bow and arrows or stones. This mechanical energy relies on tension, which is provided by the bending rod. After construction of the model is complete, pull it backward to establish proper and tension and then release it to watch it move forward. The Rubber Band Motor is similar to the previous model in that it also relies on tension. Instead of the rod establishing tension, the rubber band is used to establish a force to drive the model. This model can be built in two different ways - though it still requires the use of the pullback motor. The pullback motor consists of a gear, wound-up springs, shafts and housing over top of it. The spring is permanently connected to the housing and to a shaft over the gear. It is tensioned in the same way as winding a clock. This drive works by transferring the stored energy in the spring to the gears and then on to the wheels. Simply pull the model backward (as the name suggests) and release it to move the model(s) forward. 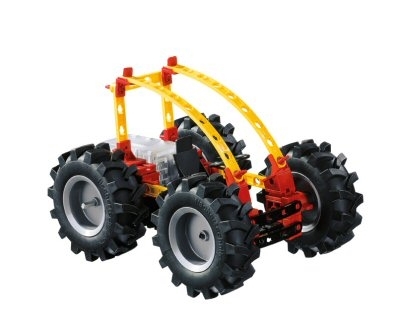 This vehicle introduces axle pivot steering to your drive models! Learn how steering works as you build your model. A double trapezoid layout allows the car to drive through curves. This element consists of an axle, a tie rod and two steering arms. Watch as you turn the steering wheel in a specific direction and the wheels follow suit. 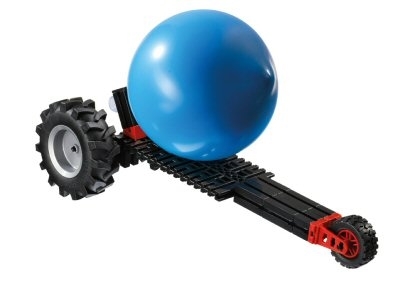 Build on what you learned from the steering model, this vehicle adds a spring suspension system. Learn why this system is so important for offroad vehicles as you discover how suspension allows the wheels of this model to follow irregularities in the road. This increases passenger comfort as well as driving safety.